It seems that even Microsoft doesn't have faith in Windows 8, the OS that the Xbox One's OS is supposedly based on. EA big wig Peter Moore assured us that the games it was showing off on stage at E3 were running on comparable dev kit specs to the actual home consoles. While this may have been true for the PS4, Microsoft made sure that its games were running on the most stable system specs available on the market and in some cases that may have been an HP powered, Windows 7 system with Nvidia's 700 series GTX GPU. It all started when US Gamer's Julian Rignall tweeted that the Xbox One game he was playing with an Xbox One controller crashed to a Windows 7, Hewlet Packard-branded desktop. But that's just one man's experience on one specific machine that may or may not be the truth. As they say on the internet "pics or it didn't happen". Well, ask and the internet delivers. 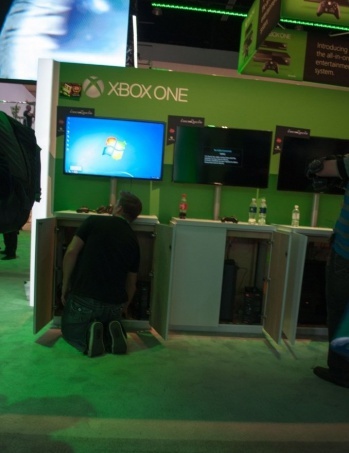 These two pictures clearly show an Xbox One controller hooked up to PC hardware. 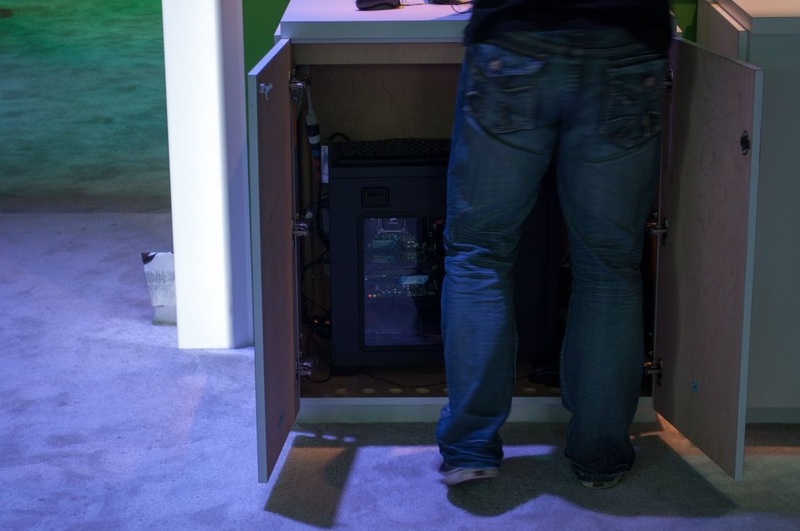 The first picture to the right shows the iconic Windows 7 splash screen bellow an Xbox One display, and the second picture here actually shows a PC desktop in the supposed Xbox One cabinet. Busted. What is more surprising is that it seems Microsoft doesn't even trust its own operating system, opting to run Windows 7 instead of Windows 8, the OS that the Xbox One's OS is supposedly based on. The fact that the desktops were apparently running Nvidia 700 series GTX cards is another worrying revelation if proven true. The 700 series GTX is considerably more powerful than the modified AMD GPU the Xbox One will run on. For the record, Sony has officially come out and assured us that all PS4 demos shown at E3 were running on actual PS4 dev kits. Update: Several Xbox One developers have come out and confirmed that their titles were most assuredly running on actual Xbox One dev kits. Apparently, only a single title: Lococycle, was running on a PC because it had not been ported to Xbox One yet, and the decision was made by the dev team, not Microsoft.